So, it has been a long time since I published a post on this blog. I fell out of love with blogging and social media for a while, but after some time away I've discovered my mojo again... and the sunshine definitely helps! Speaking of which, the UK is currently experiencing a heatwave, so I thought I'd come back to blogging with a post about keeping your dogs cool in these temperatures. 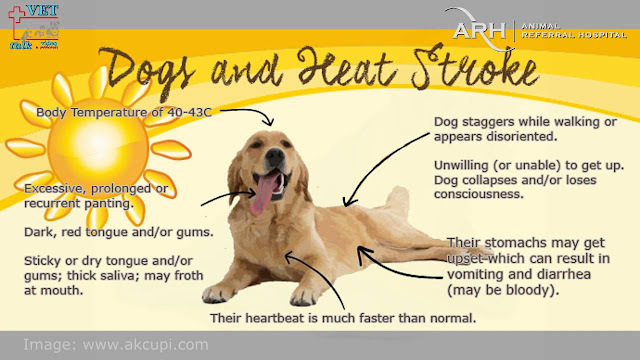 Heat stroke can be fatal in dogs, and it's important to know the signs and do everything you can to stop your dog from overheating. Some of these may seem obvious, but they're worth mentioning! Don't take your dog out during the hottest hours unless you absolutely have to (for the vet etc). Walk them very early in the morning, or late at night; hot pavements can severely burn little paws! If the pavement is too hot for you to hold your hand against for 5 seconds, it's too hot for your dog. This goes without saying, but do not leave your dog in the car. Not even for a few minutes. Shaving a dog's fur short can actually restrict air flow and make them feel worse in the heat; this isn't true for all breeds though, so make sure to do some research before you send them to the groomers for the chop! Giving your dogs lots of icy cold water can upset their tummy; freezing food into cubes is better as they slowly crunch them, rather than gulping down freezing liquid. You could also give them an ice cube to play with. Obviously, fresh water should always be available to your dog. Archie and Winnie get a new paddling pool every year, just a cheap little kid's pool from Amazon. We fill it with cool water and pop it in a shady part of the garden, so they can dip in and out as they please throughout the day. Archie absolutely loves it, but Winnie only goes in when she's really warm and needs to cool off. I put in floating toys like tennis balls, and Archie loves to splash around trying to get them all. A pool is definitely a summer must-have for us. Another option is to buy a cooling coat, bandana or harness for your dog. We have an ice coat from Pets at Home, and a cooling bandana from Dog Snug. The general idea for most of these items is the same; you soak it in water, wring it out, and then the evaporation of the remaining water cools your dog as they wear it. It's worth noting however, that you need to make sure you keep soaking the item in water as soon as it dries out. If you leave it on once it's dried, the warm air gets trapped between your dog's body and the coat/bandana, making them feel even hotter. We have a few cool mats dotted around, you can pick these up at B&M for as little as £4.99. Archie totally loves them and actively seeks one out when he's feeling too warm (as you can see from the photo!) They definitely work, I'm sure I'm not the only one who has rested my feet on one after a long day in the heat! If your dog chews things up though, they may not be the best option as they're full of a special gel which would be harmful if ingested. So there we have it! Some of my tips for keeping your dog cool in this hot weather. I hope you're all enjoying the summer safely and happily! I'm so excited as we're off to Crufts tomorrow! I've never attended before, and it's always been something I've wanted to do. I watched coverage of the show religiously as a child, and I can't believe that all these years later, I'll be there with my own dog. Poppy's Picnic have invited Winnie and I along, and I'm super excited to share the day with you on the blog and our instagram stories. As he's a little nervous, Archie will be spending the day at my parents' house. He's a sensitive chap and big, indoor events with lots of dogs are too much for him. I'll be buying him lots of presents to make up for it! I thought you might like to see what we're taking with us, and what I'm planning to buy! I always have some essential items that come with me to every event. These are treats, poo bags, a portable bowl and a bottle of water. Of course I take my camera too! Everything else gets changed out depending on the season and weather. Tomorrow we'll be leaving super early (and we're forecast cold temps and rain!) so I'm taking Winnie's beautiful Dachshund Couture coat and her hand-knitted snood from Harry Dachshund Crafts. Inside the show, where it will be warm I imagine, she'll wear her pink shetland wool harness from Teddy Maximus, her Devil Dood Designs lead, and Leather Shed UK collar. Who knew that a trio of items, all from different brands, could be such a perfect match?! It's my favourite combination for her at the moment. I may pop one of our bandanas in my bag too, but I'm not sure. Now, onto our Crufts wishlist! My two really have everything they need, but I definitely want to get a Pet Teezer, which is a tangle teezer brush for pets! I think it'll be perfect for Archie, and my bunnies as well. I believe these are being sold on the Battersea stand. I'm hoping to stock up on Lily's Kitchen travel snack bars, some Chuckit! balls for Archie, and my Mum has asked me to buy Dogrobes drying coats for her dogs as well. I'm sure I'll come home with lots more than this (I have no self-control!) but that's all that's on my list. Are you at Crufts tomorrow? Please say hi if you see us! Did you have snow last week? We did, and quite a lot of it! It was quite inconvenient as some important appointments had to be cancelled, but it was still lovely to have a few snow days off work. We made the most of it and had a lovely woodland walk... I took some photos that I just had to share. Winnie absolutely despised the snow! Honestly, it was hilarious. I knew she wouldn't like it, but I didn't realise quite how cross it would make her. She only went out to pee about three times in four days, and when I tried to do a photoshoot I had to wrap her up in two coats and a snood! She looked absolutely ridiculous, she still hated it, and so we abandoned that idea pretty quickly. I wasn't going to make her go out walking in it, so instead, I put together a makeshift sling and carried her about whenever we went on a walk. She totally loved it, Archie got to enjoy the snow and I was a happy dog mum. Did you enjoy the snow? 15K Thank You and Giveaway! Soooo yes, it's been a month. Apparently, I'm taking my 2018 goals pretty seriously! I decided I wanted to take a little step back from the blog and social media this year, as I was actually finding it all a bit toxic. Going out on adventures without my camera has been so liberating! Honestly, I hope everyone makes the effort this year to just put their phones/cameras down a little more. Life really isn't about likes and freebies, and it's so wonderful to just let go of it all. Perhaps ironically then, the reason for this post is that Winnie hit 15,000 followers on instagram! That's such a huge number to me, I can't quite believe it. I many not have been on social media as much, but I still want to mark the milestone. I remember my mum saying "I'd be shocked if she hit 10k"... and now here were are at 15k! To celebrate this (and the one year anniversary of her instagram account), I thought I'd have a little giveaway. The prize will be a bundle of goodies from my etsy shop, and I'll pick up some bits at Crufts too most likely. (Oh yes, I'm heading off to Crufts for some shopping!) To enter the giveaway, just leave a comment below with your favourite aspect of dog ownership. Additionally, you can head over to Winnie's instagram and enter there, too. The giveaway will close on 11th March and the winner will be contacted privately after that date. Good luck!